During other players’ turns, Meiling’s max hand size is 7. Meiling may choose to skip her turn. When Meiling skips her turn, she may draw four cards. You cannot skip two turns in a row. Activate this when another player attacks. Attack the attacker, regardless of range. If Meiling skipped her last turn for any reason (such as from Cirno’s “Perfect Freeze”), she may not choose to skip her turn. 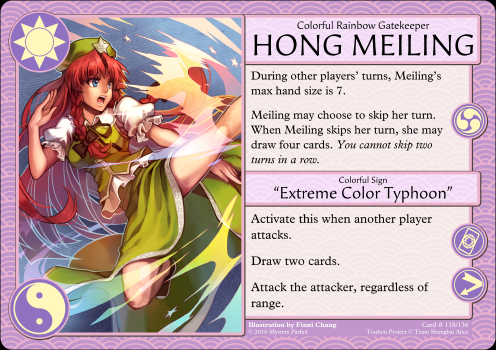 If any effect causes Meiling to skip her turn, she may choose to activate her Ability to draw four cards. When Meiling activates her Ability to skip her turn, she skips all steps, including the Incident Step (so no new incidents will be drawn or checked), the Draw Step (so she will not draw 2 additional cards), and her Discard Step (so she will not be forced to discard down to her max hand size). If Meiling is the Heroine, her max hand size is 5 during her turn (assuming she doesn’t skip it), and 8 during other players’ turns. She starts the game with 5 cards in hand.